It seemed like any other Wednesday in September at The Center. Things were relatively quiet after a previously hectic week at EXPO CHICAGO, and the Client Services team was expecting an appointment with Israel Idonije who had a large watercolor piece that needed display options. When the client arrived with the watercolor, the team quickly realized that “display options” was an understatement. The Conservation Center prides itself on interdepartmental collaboration and the consultation soon included several conservators from many departments, all of whom were ready to Bear Down and tackle the task at hand. While the piece most certainly fell into the Paper Department’s specialization, often having multiple conservators in a dialogue facilitates troubleshooting the logistics of a complex project. The team unrolled the first piece, which measured 213 ½” x 55” and began to evaluate the best way to display an 18-foot work on paper. Waterbodies (Lake Michigan I) is one piece from a series of five monumental watercolors by Chicago artist Lynn Basa. Basa, who was working in the graduate studio at The School of the Art Institute of Chicago, quickly realized the limitations of creating large watercolors indoors. One day, as she was looking out of her apartment window overlooking the lake, Basa realized there was a place where she would have enough space and enough water to create these pieces. To Basa, using watercolor on paper was central to expressing the fluidity of the piece. While the goal of any display is to be aesthetically pleasing, enhance the piece, and convey the artist’s intent; it is also paramount that the display functions to keep the piece safe. “With these types of large scale installations it is important to understand the specifics of the locations. We always consider the environmental factors, such as what type of traffic the piece will be exposed to or any architectural elements that might influence the installation,” says Toby Joyce, Director of Conservation Framing. After several preliminary meetings and an on-site consultation, The Center finalized the details to execute the installation. Under the direction of Basa, the Paper Department installed grommets around the perimeter of the piece. The holes around the grommets were reinforced to ensure the paper could support its own weight. The grommets were then compensated so that they integrated seamlessly into the piece. Senior Paper Conservator, Brian Kapernekas worked closely with our mount-making specialist in order to engineer the best mount to accommodate the thick paper. 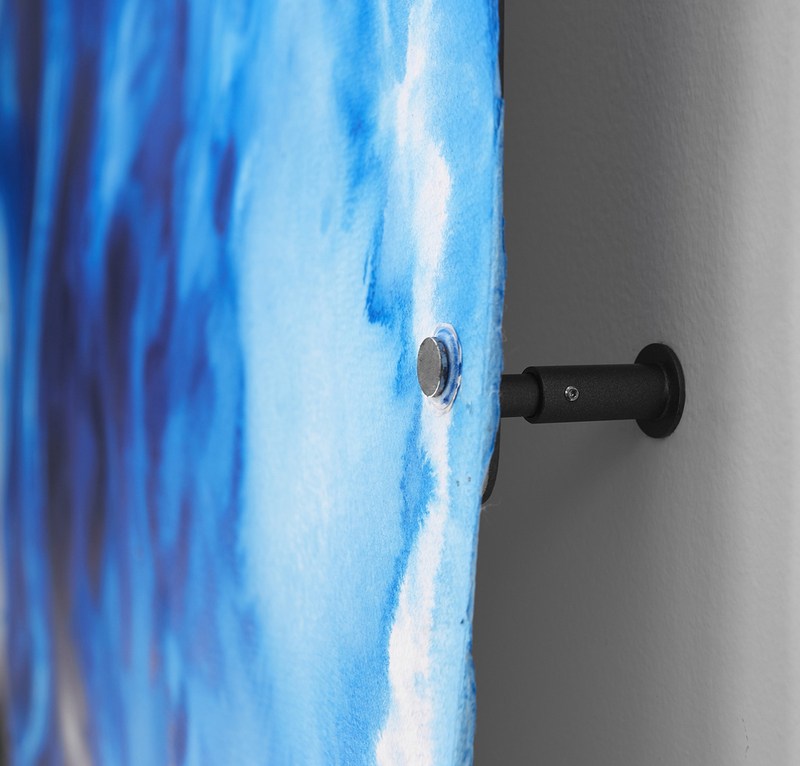 Once the grommets were installed, a custom mount system was fabricated using Brian’s specifications. The piece was attached mechanically to adjustable brackets at the top and bottom to provide the support needed for such a large piece. The mounting system consisted of a series of standoffs that were attached to the grommets along the side using magnets. "Paper is natural-- it has a life. The magnets on the sides allow for subtle movement of the piece," explains mount specialist, Derek Sutfin. The depth of each standoffs was adjustable which allowed the team to maneuver around a soffit that changed the plane of the wall. While the mounting system is visible, it is not overbearing to the piece or the space. After months of preparation and treatment, the piece was finally ready to be installed. The Center’s art handling team assisted with the installation of the mounting system on the 30- foot wall in the lobby of an office. All the hard work and planning paid off as Basa stated that The Center was the first to solve the installation problem of her monumental art. "I’ve been a fan of Lynn Basa for many years, so it’s an honor to have such a unique piece bringing life to one of our spaces," says Idonije. While the installation was challenging, the team was able to anticipate any bumps along the road and the project came together flawlessly. 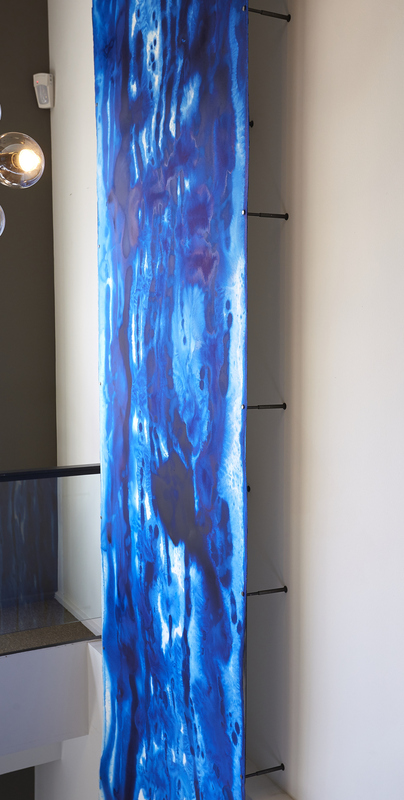 Waterbodies (Lake Michigan I) is now displayed in a way that captures its fluidity and is a showstopper in the contemporary office setting.